It’s been a while since my last update – I really should practice what I preach! In addition to ongoing projects, I’ve had the pleasure of playing a part in bringing the dPMR Association’s re-staged brand to life in social media with a broad spread of content (also on Google+, Facebook and LinkedIn) while the new website, which includes a number of White Papers, a corporate film and fresh content is scheduled to go live in early June. Production of ‘theme’, opening and closing films, preparation of keynote speeches and presentations for Kenwood’s EMEA Key Dealer Meeting 2017 which was held in Rome a few weeks ago. Strategic input on design and branding for the Brighton Bike Sheds new website scheduled to launch in a couple of weeks. General counsel and team coaching for app development specialists Insight Mobile. A confidential succession planning, remuneration and department resource project for a major UK IoT business. I’ll be sure to post links to the completed projects once they have been finalised. 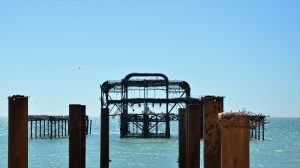 In the meantime, because a picture is worth a thousand words, here’s one of West Pier Brighton to add a little ‘pop’ to this post.